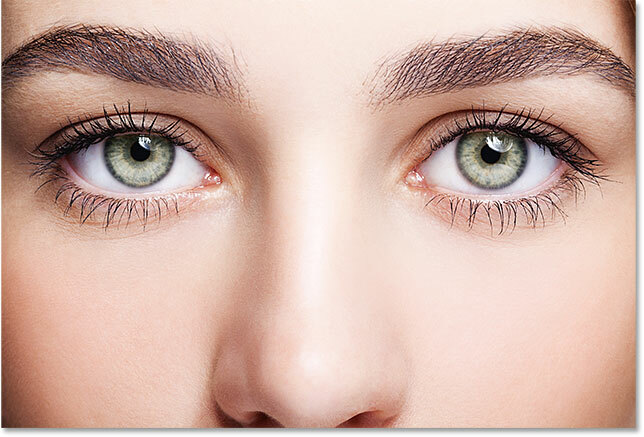 Why limit yourself to just a single eye color when you can choose every eye color at once! In this photo effects tutorial, learn how to easily give someone full-spectrum, rainbow-colored eyes with Photoshop! I was thinking of this idea while working on our previous photo effects tutorial, Add A Rainbow To A Photo. 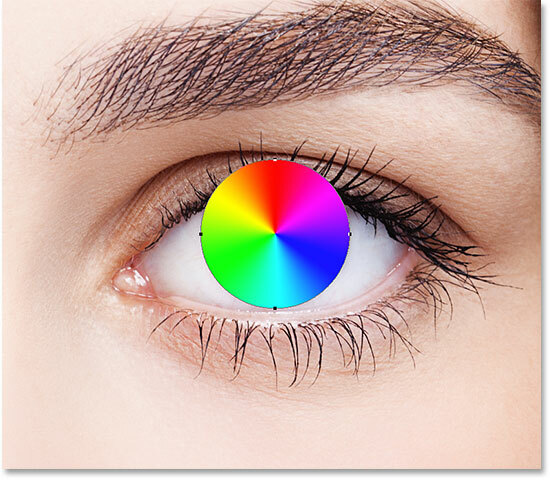 I've seen other people creating the rainbow eyes effect by manually painting different colors into the eyes using Photoshop's Brush Tool and then blurring the colors together. But there's a better way to do it, one that's less work, much more flexible, and just a lot more fun! Why is it more fun? 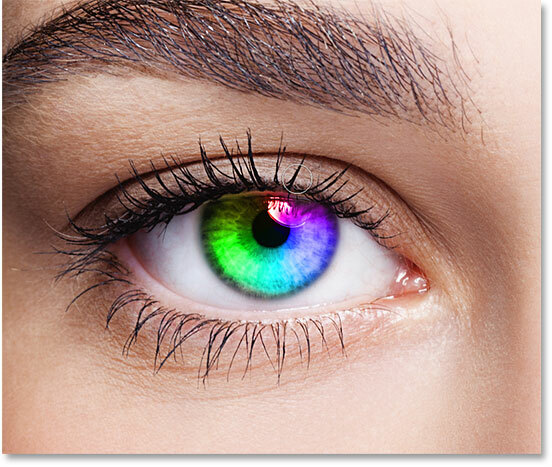 As we'll see, the method we'll be using to create rainbow-colored eyes gives us lots of room to play around. Along with the base rainbow effect, we'll learn how to easily create different variations of it, like reversing the order of the colors, rotating the colors around the eyes, and even choosing different styles and designs. And, we can do so for each eye independently, and all without making a single permanent change to the original image. I'll be using Photoshop CC but every step is also compatible with Photoshop CS6. The original photo. Credit: Adobe Stock. 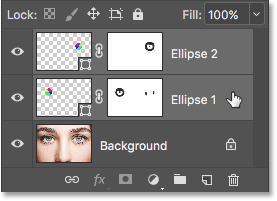 As we're about to see, we can create most of the rainbow eyes effect using a single tool, the Ellipse Tool, which one of Photoshop's basic shape tools. Select the Ellipse Tool from the Toolbar. 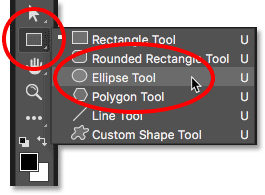 Selecting the Ellipse Tool from behind the Rectangle Tool. Watch the Rainbow Eyes video tutorial on our YouTube channel! Step 2: Set The Tool Mode To "Shape"
Setting the Tool Mode option to Shape. Step 3: Change The Fill Type To "Gradient"
Along the top of the Fill Type dialog box that appears, you'll find a row of four thumbnails. Each thumbnail selects a different way to fill the shape. From left to right, we have No Color, Solid Color, Gradient, and Pattern. 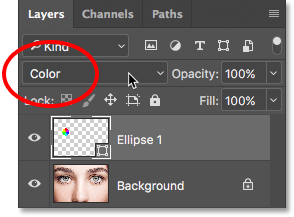 There's also a fifth thumbnail on the far right that opens Photoshop's Color Picker where you can choose a custom color. 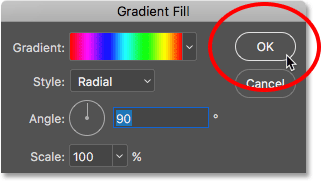 Selecting the Gradient fill type. 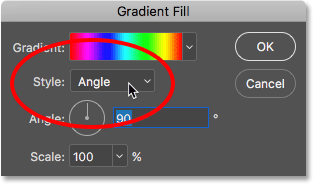 Step 5: Change The Gradient Style To "Angle"
Changing the gradient style to Angle. 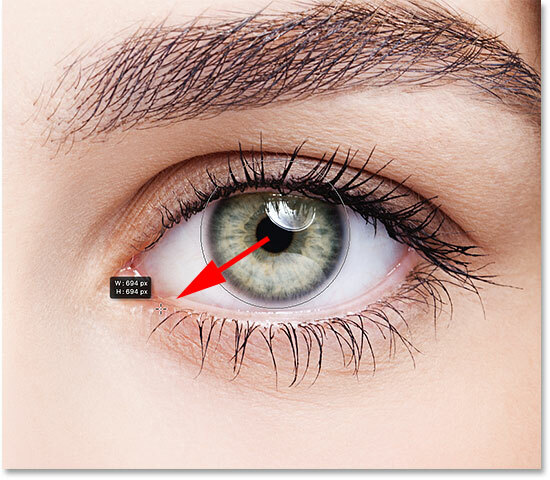 Positioning the mouse cursor in the center of the eye. Then, with your mouse button still held down, begin dragging away from that point in any direction. Once you've started dragging, press and hold your Shift key on your keyboard and your Alt (Win) / Option (Mac) key. 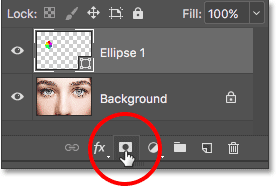 The Shift key will lock the shape into a perfect circle, while the Alt (Win) / Option (Mac) key tells Photoshop to drag the shape out from the center (the spot where you first clicked). Drawing the shape out from the center until it surrounds the entire iris. Release your mouse button, then release your Shift and Alt (Win) / Option (Mac) keys. Make sure you release the keys only after you've released your mouse button or you'll lose the effect that those keys were having. The shape covers the are we want to colorize. 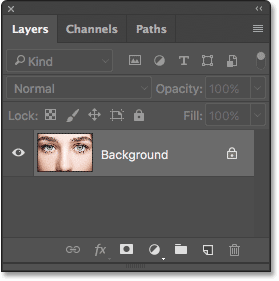 Step 7: Change The Shape Layer's Blend Mode To "Color"
The Layers panel showing the new Shape layer. 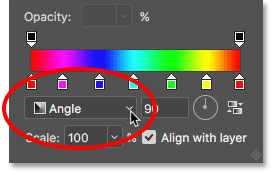 Changing the blend mode of the shape to "Color". The result after changing the shape's blend mode to "Color". 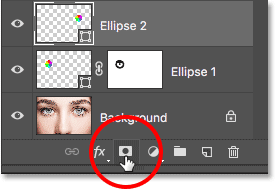 Clicking the Layer Mask icon. 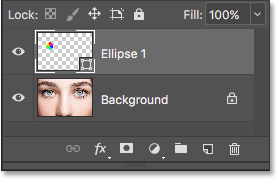 A layer mask thumbnail appears on the "Ellipse 1" layer. 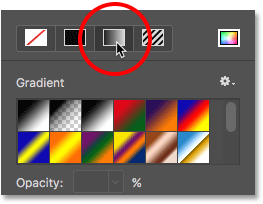 Photoshop uses the current Foreground color as the brush color, which means that to paint with black, we need to set our Foreground color to black. We can see the current Foreground and Background colors in the two color swatches near the bottom of the Toolbar. The Foreground color is the one in the upper left. The Foreground color swatch (upper left) should be set to black. 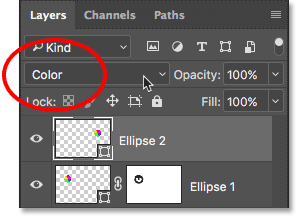 With the Brush Tool in hand, black as your Foreground color and the layer mask selected, simply paint around the outside of the iris to hide the unwanted colors from the gradient. You'll want to use a small, soft-edge brush. To change your brush size from the keyboard, press the left bracket key ( [ ) repeatedly to make the brush smaller, or the right bracket key ( ] ) to make it larger. To adjust the hardness of the brush edges, press and hold your Shift key while pressing the left bracket key to make the brush softer or the right bracket key to make the brush harder. Hiding the gradient in the white areas of the eye. Hiding the gradient in the eyelids. 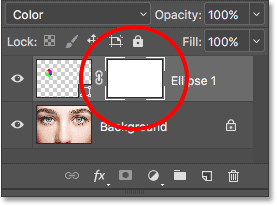 If you make a mistake and accidentally paint away some of the color in the iris, press the letter X on your keyboard to swap your Foreground and Background colors. This will set your Foreground color to white. Paint over the area with white to restore the colors. Then, press X to swap the colors again, setting your Foreground color back to black, and continue painting. Hiding the gradient in the pupil. The rainbow eyes effect so far. Positioning the cursor in the center. Click with your mouse to set the starting point for the gradient, then keep your mouse button held down and begin dragging away from that spot, in any direction. Once you've started dragging, press and hold Shift+Alt (Win) / Shift+Option (Mac) on your keyboard to lock the shape into a perfect circle and draw it out from its center. Drawing the second shape around the iris. The second shape now covers the iris. Step 14: Change The Shape's Blend Mode To "Color"
Changing the second shape's blend mode to "Color". The second eye is now colorized, just like the first. The second layer mask is added. Cleaning up the areas around the eye and in the pupil. The result after colorizing and cleaning up the second eye. If you find that the color is too bright, causing some of the detail in the eyes to be lost, you can reduce its intensity by lowering the opacity of the Shape layers. 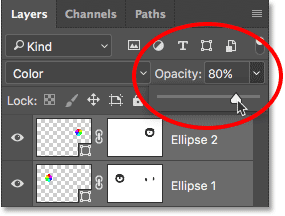 We can lower the opacity for both Shape layers at once. Selecting both Shape layers at once. Lowering the opacity of the Shape layers. The result after lowering the opacity. Now that we've created the initial rainbow-colored eyes effect, let's learn how we can easily customize it and create different variations. We do that by editing the gradient settings. Double-clicking on the Shape thumbnail for the right eye. 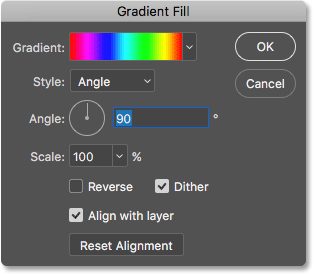 The Gradient Fill dialog box. 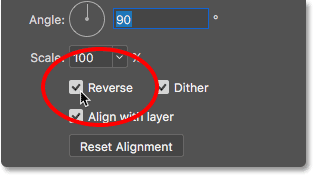 Selecting "Reverse" in the Gradient Fill dialog box. 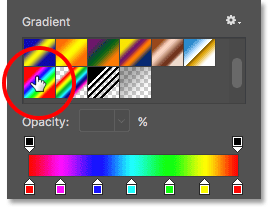 Photoshop shows us a live preview of the effect so we can keep the Gradient Fill dialog box open as we experiment with the settings. Keep in mind that we're changing the effect for only one eye at a time. 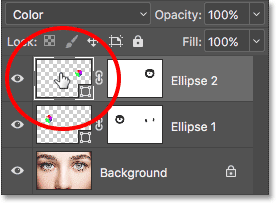 To make the same change for the other eye as well, you'll need to double-click on its Shape thumbnail in the Layers panel and use the same setting(s). Creating a mirror effect by reversing the colors in one of the eyes. 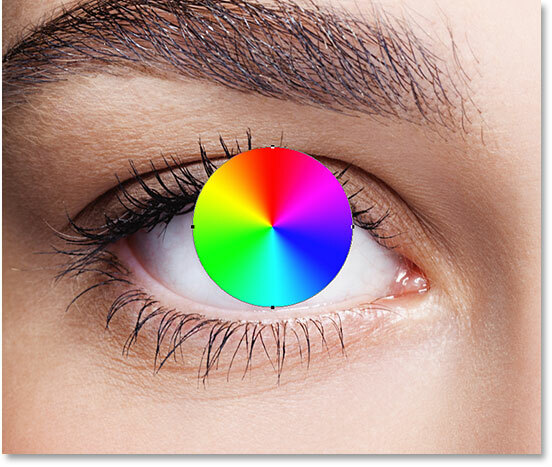 We can also rotate the colors around the eye using the Angle option. 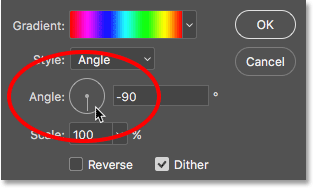 You can click inside the dial and drag it around to change the angle value, or you can enter a specific value. Changing the angle of the gradient. The effect after rotating the angle of the gradient in the right eye. 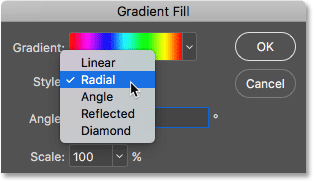 The Style option in the Gradient Fill dialog box. Changing the style of the gradient to "Radial". The effect after changing the style of the right eye to "Radial". To change the other eye as well, I'll click OK to accept my changes and close out of the current Gradient Fill dialog box. 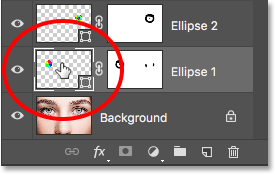 Closing the dialog box by clicking OK.
Double-clicking the Shape thumbnail for the other eye. 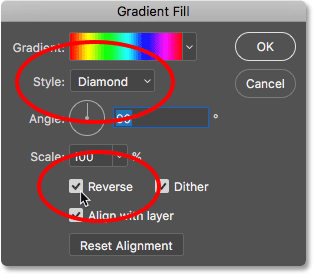 Changing the Style to "Diamond" and selecting "Reverse". Each eye is now set to a different variation of the effect. And there we have it! Looking for similar tutorials? Learn how to create a Radial Zoom Eyes effect, or learn how to simply change eye color in an image. Visit our Photo Effects section for more tutorials!